Next to make the legs. They'll be 5"x5" timbers. Massive. Marking out width for a leg glue up. I only need to trim off about 1/2". To rip or to scrub? That is the question. Let's try ripping first. A 114"-long rip, 1/2" wide. About 1/2" progress per stroke, so roughly 200 strokes. 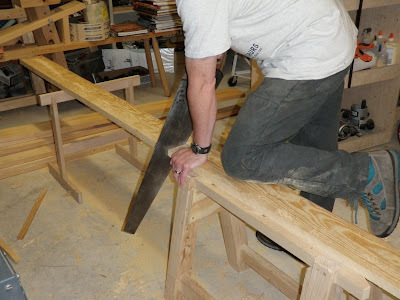 Crosscutting to the length of 2 legs. Finishing off. I really need to build another mini Krenov-style stand like the one holding up the far end. Very nice design, mortise and tenon uprights to feet and stretcher, overlapped bridle joints at top. I built it a year ago, still haven't had to glue it up. Chris Schwarz sawbench under my knee. 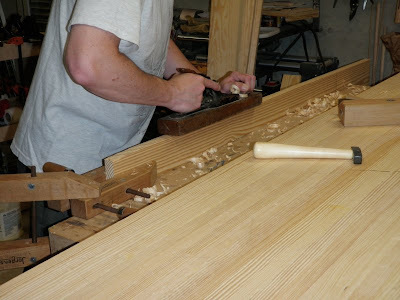 How much wood would a scrub plane scrub if a scrub plane could scrub wood? The chips literally fly when scrubbing on the diagonal. Following the scrub with a transitional jack with aggressively crowned blade. Ripping and scrubbing are about the same amount of manual labor, but the scrub and jack are much more viscerally satisfying. A long but rough curl. 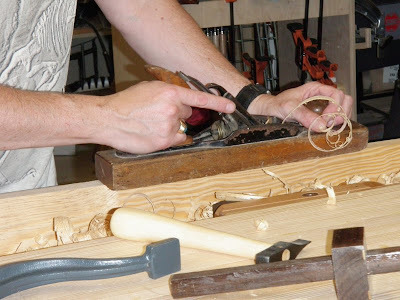 This jack is setup as a fore plane, the blade crowned between a scrub and a try plane, with a big wide mouth. Transitional planes are not just for burning! 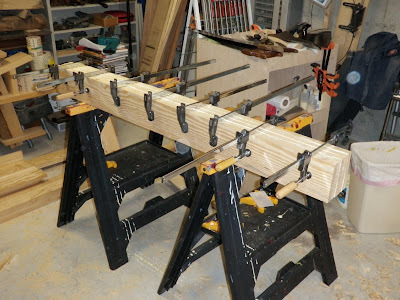 One double-length leg glue-up, for 5"x5" finished. About 50 lbs. Finishing squaring up a leg with a corrugated jack setup for trying, after roughing down with scrub and transitional jack. I'm standing on a 2x10 to get a little elevation over the work. As Chris Schwarz says, coarse, medium, and fine tools. 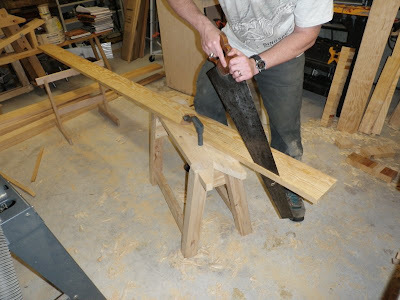 The squared-up legs ready for cross-cutting in half and trimming to length. 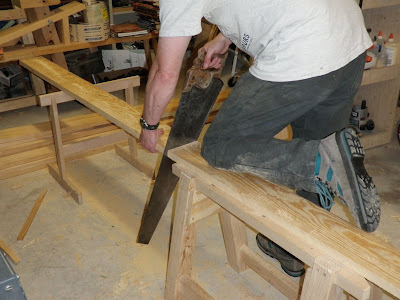 Next will be timber-frame style tenons for fitting to the top. got a ? for you concerning your Christopher Schwarz Saw Bench. 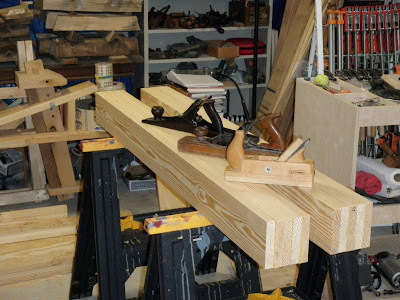 I have the pieces cut to size for the bench but I'm not sure what saw to use to cut the tenon on the legs. I tried cutting the tenon for the leg using a test piece without success. I used a LN 14" backsaw (rip) 15tpi The cut decided it wanted to wander off the line. What a mess! Could be the saw but most likely it's my technique. Do you have any pointers that would help? 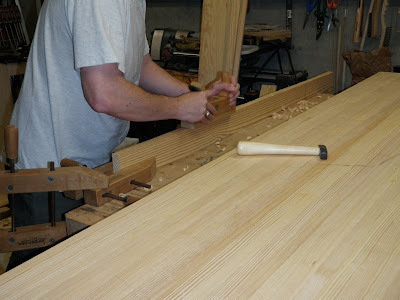 How did you cut your tenons? 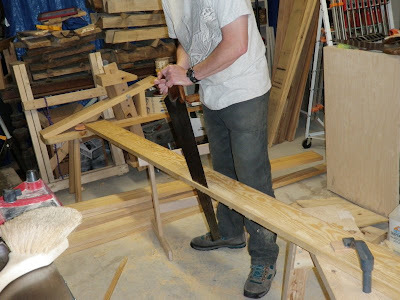 I have a pair of the LN 12" back saws, and I really like them. I agonized over whether to get the 12" or the 14", eventually settling on the smaller ones as being a little easier for me to handle. 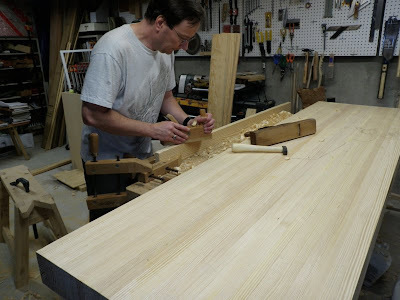 The back on the 14" is fairly heavy; while I figured it would be useful for larger tenons, I tend to do smaller work. However, at the time I built the saw bench, I only had the very small LN dovetail and carcass saw, so as I recall I used a Japanese ryoba. What I would suggest is to cut to the waste side of you line, leaving enough margin for whatever level of accuracy you're able to achieve, then trim the remainder precisely to the line. There are several ways to trim it (and they can also introduce their own problems, so practice with them first). So cut it fat, and trim to fit. 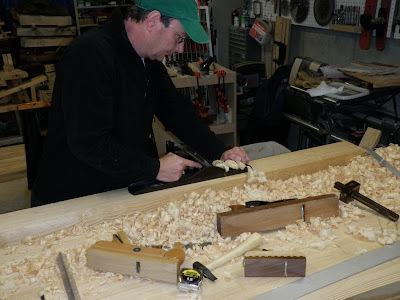 Phil Lowe has done a couple of nice articles in Fine Woodworking about using shoulder planes or chisels for this. You can also use a #10 bench rabbet plane, or a regular rabbet molding plane. The #10, while a little harder to find, is about the easiest, because it's a reasonably lightweight bench plane yet has a large bearing surface and cutting edge. 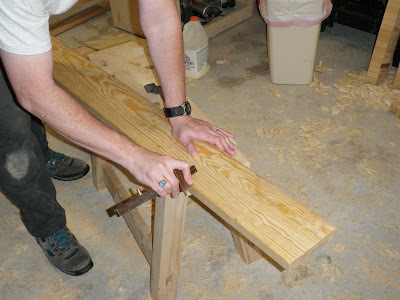 Whatever method you use, come in from the far side of the tenon first before doing the main trimming, so you avoid blowout of that edge. And I forgot to mention, another way to trim is to use a router plane, like a Stanley 71 or 71 1/2. The advantage of this tool is that when you rest one side of the base on the face of the workpiece and the other on another matching thickness piece, the iron is maintained at a specific depth, so guarantees a uniform flat face on the tenon cheek.